Okinawa, an island chain, is Japan's southernmost prefecture. Described as a beach resort, this prefecture attracts people from all over Japan who are looking for that tropical escape to white sands and brilliant blue waters. It is easily accessible by domestic flights and due to the American military influences, is quite English-speaking friendly. Okinawa has a unique culture that differs to the rest of Japan making it a one of a kind destination. With 27 golf courses and a plethora of beaches, this place is truly a perfect getaway to relax and recharge. Whichever island you land on, there is always something to see, do or try. Renting a car once you land is the most convenient option and many companies offer great prices with English-speaking GPS systems. Route#58 is a very famous road that travels up the side of the main island with breathtaking ocean views on one side, and many tourist attractions along the way. Top picks would be the Churaumi aquarium - home to some very impressive whale sharks, the ruins of Katsuren Castle – UNESCO world heritage site, Makishi Public Market – referred to as the “Kitchen of Okinawa”, Ishigaki Island – an isolated island with famous star-shaped sand. Depending on your available time there is enough to see and do in Okinawa that would keep you entertained for a while but, if you are looking to wrap up a lot of experiences into one place then try the Murasaki Mura (体験王国むら咲きむら ) in the central region. This is a park which allows visitors to experience 101 different types of Okinawa culture ranging from karate to Ryuku glass making to enjoying the traditional Okinawan cuisine. 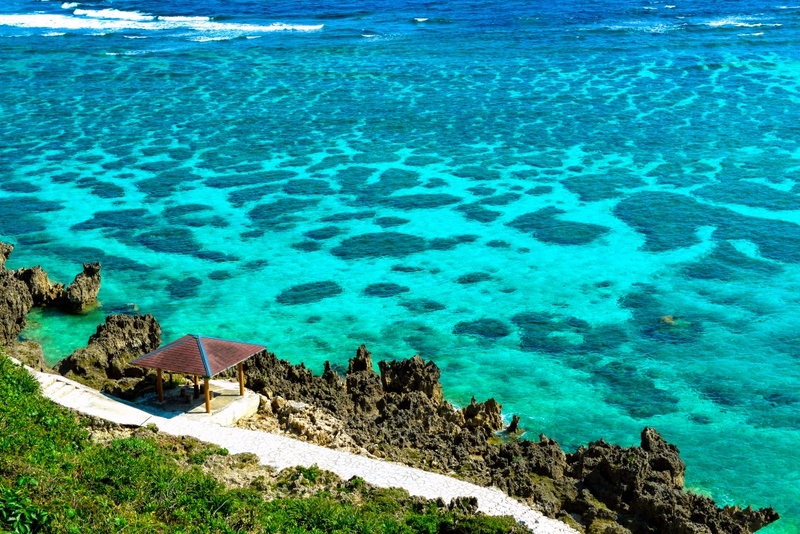 If you are looking for more water-based activities than the snorkelling and scuba-diving are amongst the top activities to do in Okinawa due to its stunning coral reefs and abundant marine wildlife. The Ryukyu Lantern Festival which takes place in the first week of December until mid-February. Located in the Murasaki Mura cultural park mentioned earlier, the park is adorned with thousands of Chinese lanterns illuminating the area with light for the traditional Okinawan cultural performances that take place. Whale watching in the sea around Chibishi and the Kerama Islands. Numbers of humpback whales greet visitors on boats from December to April each year. The Naha Festival which is the largest festival in Okinawa. Held every year in October, you can see a variety of traditional and contemporary Okinawan performances along with a giant tug of war event. Not just any tug of war either - this event has been recognised by the Guinness Book of Records as the largest in the world! Okinawa has a completely different vibe to mainland Japan and so it's no shock that it's food would reflect this. Taco Rice is a favourite (think taco ingredients on top of a bed of rice) along with pork-belly dishes such as Rafutee. To really experience all the flavours of Okinawa,visit the Kokusai Dori-Yatai-mura （国際通り屋台村） in the southern region. Here you have access to over 20 stalls selling traditional Okinawan dishes made with local ingredients. While you enjoy your dish, sit back and watch the various performances on the stage. Of course the seafood is served fresh and you can treat yourself to Lobster, sea urchin, and freshly fried tempura which has all been caught locally. Visit the Awase or Toya fishing port to sample these delicacies. It is no secret that Okinawa is home to some of the best alcohol in Japan particularly, 'Awamori' which is a sugarless shochu. Pick up or bottle or 3 to take back with you or better yet, head to the distillery Kamimura Shuzo. Here you can take a tour and finish off by making your own souvenir awamori bottle. For future good luck you could also bring home a pair of Shisa Gaurdian Lions. Traditional protectors of homes across the Okinawan islands. A box of Okinawa cookies are great to share back at the office and come in a variety of flavours including Okinawan sea-salt, brown sugar, and sweet potato. For a more secluded getaway, stay on one of the isolated Islands. Miyakojima has two golf courses and if you were to stay at Imgya Coral Village, you can enjoy a beautiful garden and outdoor swimming pool with easy access to Maehama beach. Beaches, bars and golf – Okinawa is that perfect escape. The subtropical climate and laid-back Okinawan vibes gives that island feel unique to the rest of Japan. Its warm weather is perfect for getting that extra distance out of your swing and, with nothing but blue sky above, your day of golfing in Okinawa is going to be truly enjoyable! From the Kansai International Airport take a 2hr15min flight on either Jetstar, Peach, JAL, JTA or ANA airways. It is considerably cheaper to travel from Narita airport (Jetstar) than Haneda (skymark, ANA) but also takes approx 1hr longer (3hr35min).